Review of the The High Life Video Slot, Febuary 2007. Capturing the lifestyle of the wealthy who know how to enjoy their good fortune, Microgaming have captured the essential elements of this in its new 5 reel, 5 pay-line video slot called THE HIGH LIFE. From luxury cruising on a private yacht and glamorous cars to glittering diamonds and palatial mansions, it's all here in a champagne cocktail of a game that offers the player a taste of the good life and an opportunity to score a few riches to boot, all in sharp, bright graphics on a rock-solid and well proved software platform that rates among the best in the world. And there are some uniquely rewarding features. The High Life is a truly one-of-a-kind game, where all symbols pay in any position on a pay-line. The only symbol that does not do this is the Scatter symbol, that glossy red Ferrari that acts as the generous scatter symbol in the game and can pay anywhere on the reels. But it gets even better, because when 3 of these luxurious autos come up together it's Free Spin time where up to 10 free spins are triggered, each with the potential to double all prizes and generate further spins-within-spins. Be on the lookout for the Mansion symbols on Reels 2 and 4, too. These substitute for all symbols except Scatters, leading to rewards of up to $60,000 in the Base Game. This can be doubled up to $120,000 in the ever generous Free Spins feature. 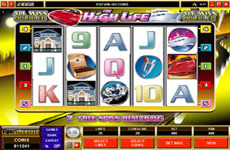 The High Life brings together the thrill of gambling on an unusual and entertaining video slot and the advanced technology of a fast, smooth software engine that makes playing a reel!